Baby Syn takes 2 puppy match show Group3’s and a Puppy Reserve BIS! She also earned her Trick Dog titleat 5 months and her CGC at 4 months! Raine takes BOW both days in Ocala Florida for 4 points. Plus a Best Of Breed Owner Handler. Sherman, BISS Edelmarke Second Coming,JH, ROM! Sherman now qualifies for his ROM status! He has produced 13 Champions to date! He also has Dock Master Divers, JH’s, OAX, Fast Cat, CD and Water Retrieve titled get. One Australian Champion and two in NZ! Raine, Edelmarke-Shade Mtn Raine Song, JH takes two points in Lakeland FL, and another 12 points, with one major, from bred by class. He also garnished multiple Sweeps wins! ❤️ He recently finished his JH with high scores in 4 straight passes. 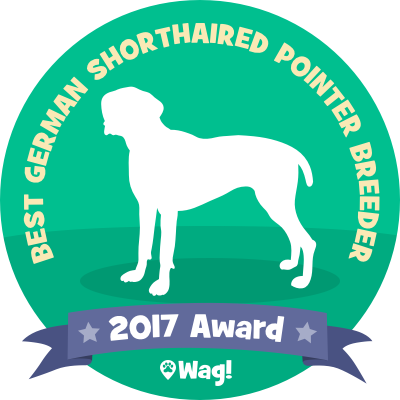 Edelmarke Reg'd - German Shorthaired Pointers based in Ocklawaha, FL is a Top 2017 German Shorthaired Pointer Breeder!